Fun With Frisian: BERIN - "course, way, slope"
BERIN - "course, way, slope"
The subject of this lesson is berin, a modern West Frisian word that means "course" or "way," and sometimes also "slope." The first syllable takes a schwa and the final syllable is stressed, with an "ih" vowel so it sounds like "in." Buh-RIHN. To remember this fine Frisian word, think of the English word "bearing" which is etymologically a cognate. 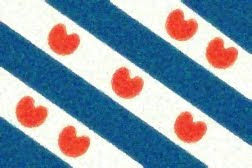 Both of today's examples come from the Hallofryslân Woordenboek. It moat syn berin hawwe. It cannot be forced or rushed; it must follow its course. It means "it" here and is said with a schwa. UHT. Moat is the third person singular of the verb moatte meaning "must." Say it with a long "ah" as in "father." The infinitive ends with a schwa. MAHT, MAHT-tuh. Syn means "his" or "its" and is pronounced with a long "ee" vowel. This word sounds like the English word "seen." SEEN. Hawwe means "have" or "to have" and is said with a long "ah" as in father and with a schwa on the end. The -ww- is pronounced like the an English -v-. HAHv-vuh. It berin fan de seedyk. The slope of the sea-dike. Fan means "from" or "of" and is pronounced like the English word "fawn." See is West Frisian for "sea." It is pronounced with a long "ey" as in the English word "day." SEY. Dyk means "dike" and is said with a long "ee," like in the word "peek." DEEk.